In response to the growing emphasis on the downsizing of US military infrastructure and the enactment of federal Base Realignment and Closure legislation calling for closure initiatives, the Bay County BRAC Committee, Inc. was formed. The organization became an independent, not for profit corporation and later changed its name to the Bay Defense Alliance, Inc. The organization was founded by community leaders involved with the Bay County Chamber of Commerce, the Bay County Economic Development Alliance and other key organizations, and the 30-member board includes representatives of the Bay County Economic Development Alliance, Bay County Chamber of Commerce and Panama City Beaches Chamber of Commerce. Since its inception, the mission of the BDA has been to study every aspect of our military installations and work to preserve and enhance their missions and military value. Working closely with our congressional delegation toward this common goal, the BDA has leveraged volunteer hours by former military members, subject matter experts and community leaders for the benefit of Naval Support Activity Panama City and Tyndall Air Force Base. 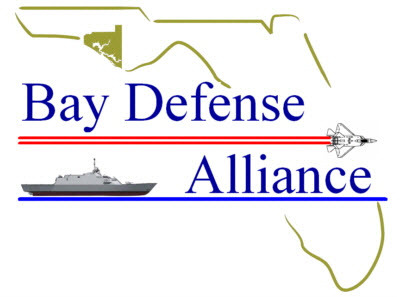 The Bay Defense Alliance also partners with the Florida Defense Alliance and Florida Defense Support Task Force to ensure Florida earns its reputation as the most defense-friendly state in the nation. The BDA works closely with installation leadership to facilitate the Defense Infrastructure Grant program which provides funding for special projects of mutual benefit to our local bases and the community. To date the Defense Infrastructure Grant Program has brought more than $5.5 million in grants to Bay County Installations.